Whether walking down the Venice Boardwalk, scooting along in traffic or sitting outside your favorite coffee shop, it’s no longer strange to see and smell a large plume of flavorful marijuana vapor bellow out of someone’s mouth. That’s because more and more people are embracing vaporizing, or vaping, as their preferred method of consuming cannabis. Here we’ll take a look at some disposable vape pens to suit any mood or condition, along with some suggested brands and helpful tips on how to find the right one for you. Vaping is the process of heating marijuana flower or extracts to a temperature hot enough to cause it to vaporize but, and this is important, without burning it. Water vaporizes at 212 °F, so most agree that vaping between 350 and 400°F is best for cannabis. Health benefits, numerous choices, and convenience make vaping much more appealing than smoking; and with both tabletop and portable solutions like disposable pens, they can be enjoyed from anywhere. Smoke of any kind, including marijuana, contains harmful toxins. This study looks at the toxins in marijuana smoke and compares them to that of cigarettes. Though it’s never caused a fatality, the study found marijuana smoke had nearly 20 times higher levels of ammonia than tobacco. Vaping avoids these unwanted toxins entirely, resulting in increased respiratory function among former smokers, according to a study by the Harm Reduction Journal in 2007. Vape pens are cannabis devices designed much like e-cigarettes, making them generally small, thin and discreet. They can cost as little as $15 or as much as $200 and require maintenance like recharging the battery and refilling the cartridge. As is the case with all vape pens, there’s a light that indicates when a dosage is complete. Many have a button that must be pushed while inhaling in order to activate the heat source. Most of the pens that require maintenance are also interchangeable. There are five main parts to a vape pen; in order from bottom to top: battery, button, tank/cartridge, atomizer (heat source), and mouthpiece. The majority of pens made now follow an industry standard known as 510 threading, which allows you to interchange almost any cartridge onto any battery. If you’re thinking of experimenting with vaping before you buy a potentially expensive pen that you’re unsure how to maintain, let alone if you’ll like it or not, consider disposable vape pens. These pre-loaded devices require no maintenance, cost less, and can be thrown away when empty. Disposable vapes are to vape pens what training wheels are to bicycles. They’re available at most dispensaries and cost around $15-20. Coming in a variety of brands and strain specific flavors, disposable vape pens don’t have rechargeable batteries so you don’t have to worry about a dead battery unless all of the extract is also gone—in which case, you’d just throw it away. 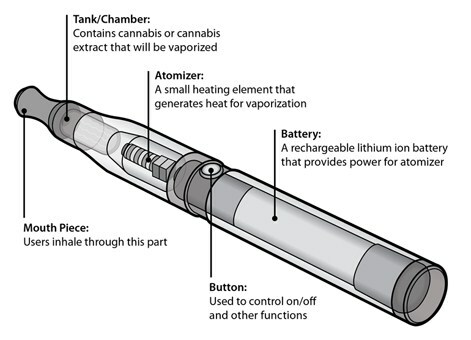 With disposable vape pens, there’s often no button required to activate the heat source. Just inhale and wait for the light to indicate a complete dose. So rather than being the dumb friend who tries to inhale without the button, you’ll be the dumb friend who doesn’t inhale at all because you can’t find the button in the first place. It’s okay, we’ve all been there. While there are several brands and flavors to choose from, finding the right one(s) can be overwhelming; so we’ve made it easier. Here are a few simple things you can do to optimize your vaping experience. Ask how many hits a new pen gets. Each pen should get you no less than 100 hits, upwards of 200. Depending on whether it’s filled with wax or oil, the measurement can vary so make sure to ask how many doses the amount equates to. Test the pen before you leave the shop. Even if you have to unpack it and it takes an extra minute of your day, you don’t want to leave the shop with a bad pen. Dispensary refund policies are rare. Choose a brand that has your favorite strain(s). Several companies make specific pens derived from popular strains. If Sour Diesel is what you’d normally smoke, you won’t have trouble finding a disposable with SD. Do your research. Spend some time on message boards, do google searches, and ask friends and/or family which disposable vape pens they like most. There are seemingly countless brands making disposable vape pens and there’ll be plenty more to come. It’s really a matter of which brands your dispensary carries and how specific your tastes are. 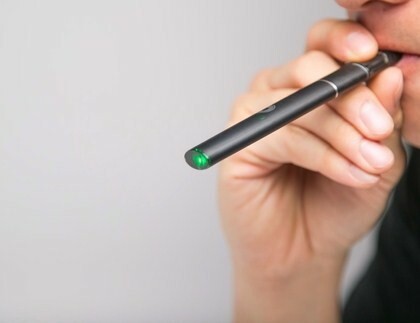 Most vape pens behave as expected, but occasionally some have issues getting a full dose from a weak battery, faulty heat source or damaged cartridge. We encourage you to try all the brands until you find the one (if any) that’s right for you; but to speed up that process, here are a few reputable ones. Sleek, smooth and silver with the signature logo, the FlavRx pen is a great one to start with because it comes in several of the most popular strains and the pull is smooth. Plus, it’s so discreet it can fit right in the palm of your hand. This pen’s good for about 150 hits and every hit tastes just as good as the first. Flavored to taste like the flower strain, FlavRx makes for a great transition for the marijuana purists wary of artificially flavored vapes. Get one for $20-$25. If you’re looking for a CBD product, Evoxe is a good place to start. 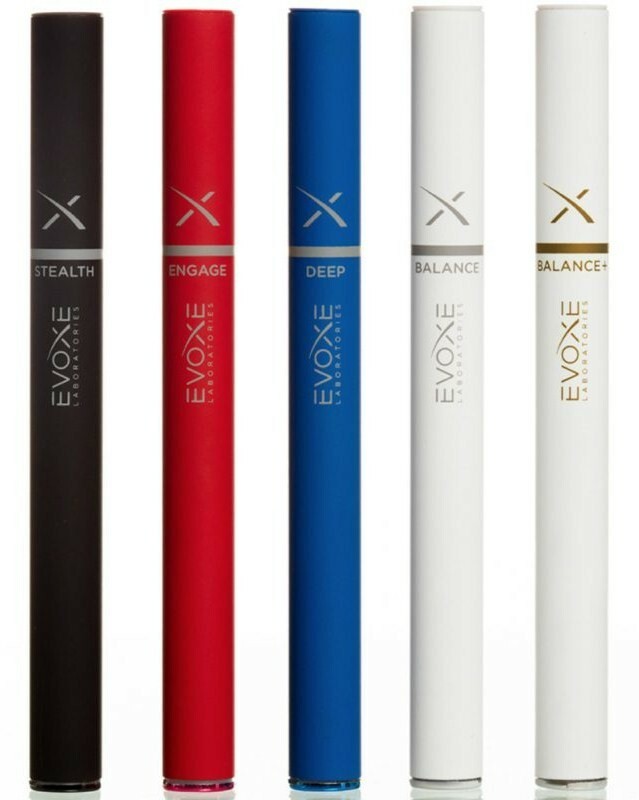 Moderately priced at $40-$50, Evoxe uses oils made of cannabis as well as other natural herbs to include aromatherapy in crafting your vaping experience. 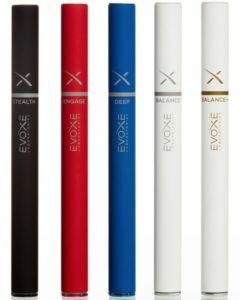 With a small selection of products designed to both calm you down and amp you up, Evoxe is a great value for those interested in testing out vaping. Each type comes in a different color and is about the size of two stacked Chapsticks. If you’re like me and you prefer sativas, Spliffin Quattro may be a good place to begin. 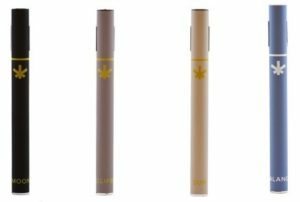 This particular pen only offers six strains (three indicas and three sativas), though the sativas are the more popular: Super Lemon Haze, Tangie and Jack Herrer. Spliffin vape pens hold less in the tank than other brands but, between that and the limited strains, it’s reflected in the price—costing around $15. 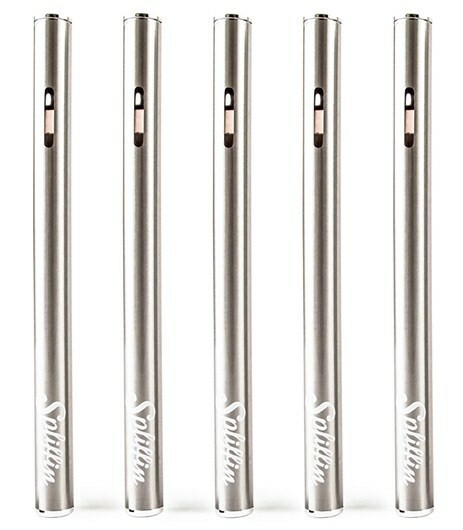 All their pens look the same, regardless of the flavor: skinny, pearl gold, and just over palm-sized with logo printed along the bottom. 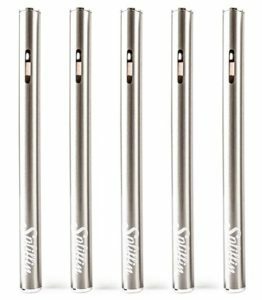 Costing closer to $100, the innovative hmbldt vape pen was voted a “Top 25 Invention of 2016” by Time Magazine. Rather than dividing their product by strain, hmbldt pens are designed to stimulate different areas of the mind and body to improve sleep, increase blissfulness, provide pain relief, and even activate arousal. A cool feature? Rather than a light to indicate a full dose, there’s a gentle vibration. 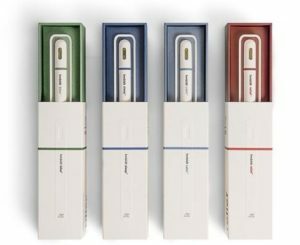 These pens are shaped like the old-school, five-in-one colored pens: small, white with a colored band around it changes between pastel colors based on the flavor. Marked by its logo, a squared-off marijuana leaf that looks like a modified asterisks, Wildflower pens are top notch. Offering both CBD and THC options, both promising 150 doses, these disposables are a solid value at $55 for CBD and $60 for THC. Wildflower pens come in one of six flavors: four CBD and two THC. With a smooth hit, color variation between flavors and a 100% customer satisfaction guarantee, Wildflower is definitely a great way to get the toes wet before diving into the deep end of vaping. Whereas our ancestors smoked out of pipes, our children will vape. It’s cleaner for the body and the environment, involves less preparation than packing a bowl or grinding down flower, and typically no larger than an ink pen. There’s still an underground feel to vape pen usage as the technology behind it hasn’t yet gained common sense status. We highly recommend that you explore this space and find the vape pen, disposable or refillable, that’s right for you. Well written post! I love how the paper flows. “So rather than being the dumb friend who tries to inhale without the button, you’ll be the dumb friend who doesn’t inhale at all because you can’t find the button in the first place. It’s okay, we’ve all been there. ” Ahahahaha! Me, last night! Thanks for the detailed info for an old school smoker!